On Wednesday, the President of the Presidential Council, Fayez Al-Sarraj, called on his cabinet ministers to work to create the necessary conditions for holding elections next year. 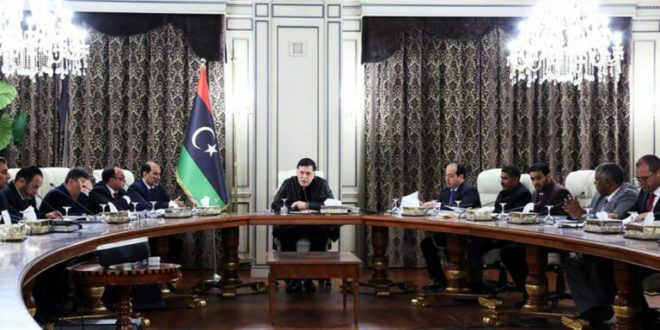 During their meeting, Al-Sarraj discussed the issues of education, transportation, energy, local governance, labor, rehabilitation, social affairs, and displaced peoples. Al-Sarraj approved a number of memoranda submitted by the ministers regarding the study and design of a number of service projects, ways of solving issues in municipal facilities, and the adoption of the organizational structure of the Ministry of Economy and Industry. The Council of Ministers of the Government of National Accord held their ninth meeting for 2017 at the Prime Minister’s Office. The meeting was headed by the President of the Presidential Council and attended by the members of the Presidential Council. The Electoral Commission had announced earlier this month the start of registration for voters and the update of the electoral register in preparation for the elections to be held next year. Previous UN mission to Libya: Article 15 of the political agreement, related to filling sovereign leadership positions, obliges the HOR to consult with the Supreme Council of the State first. A military source told Reuters: Gunmen blew up a pipeline that transports oil feeds to the port of Sidra.